"Labour relations in the public service are undergoing a transformation, possibly more profound than the public sector. The concurrent effect of economic, technological and social pressures are challenging the very concept of public service and consequently the position of employees" --from the author's general report. 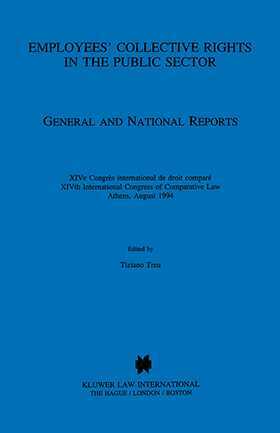 This important work brings together in one volume the author's general report and ten of the national reports presented by the panel on employees' collective rights in the public sector which convened at the XIVth International Congress of Comparative Law in Athens. collective rights and on collective labour relations in the public sector over the last decade, the most significant of which is a general move towards some kind of privatization and deregulation. The general report compares and contrasts common themes relating to employees' collective rights. National reports from Argentina, Australia, Belgium, Canada, France, Greece, Japan, the Netherlands, Portugal, and the United Kingdom follow. Each appears in the language of the originating country. The contributors to this work are specialist lawyers and expert scholars in the field. The book will interest and inform practitioners and academics concerned with employment law and public law.